The University took possession of an estimated 13,000 acres of land north of the city center on Ibadan road, although less than half of the land is in active use. 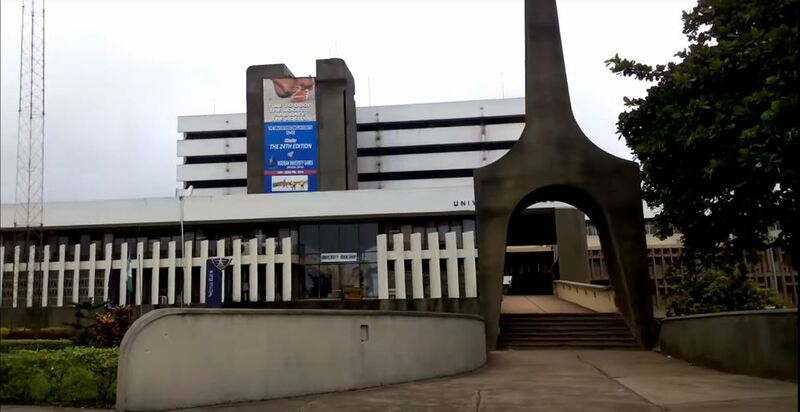 Renamed Obafemi Awolowo University (OAU) in 1987, after the Yoruba politician who became its first chancellor, the school’s initial buildings were completed from 1965-70. They are connected by designated roads identified by a set of numbers. The extensively landscaped grounds include numerous quadrangles, with many pedestrian paths linking outlying, wide-spaced faculty housing to the self-contained dormitory groups and, ultimately, to the core classrooms, offices, and other public gathering spaces . 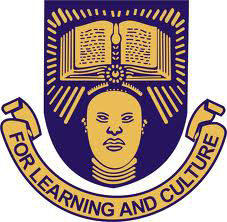 When the government of Western Nigeria established the University of Ife in 1961, the country was only a year old. When classes commenced the following year, Unife had the opportunity to proclaim the modernity of the young nation through its breadth of studies, as well as its appearance. The University controverted late colonial views concerning tertiary education. The Western Region had hosted the University of Ibadan since 1948, and by 1959 plans were underway for the North to construct Zaria’s Ahmadu Bello University and the Eastern Region to build the University of Nigeria, Nsukka. The British had recommended Lagos as the next university site, but the Western Region decided they needed a second university outside the capital. 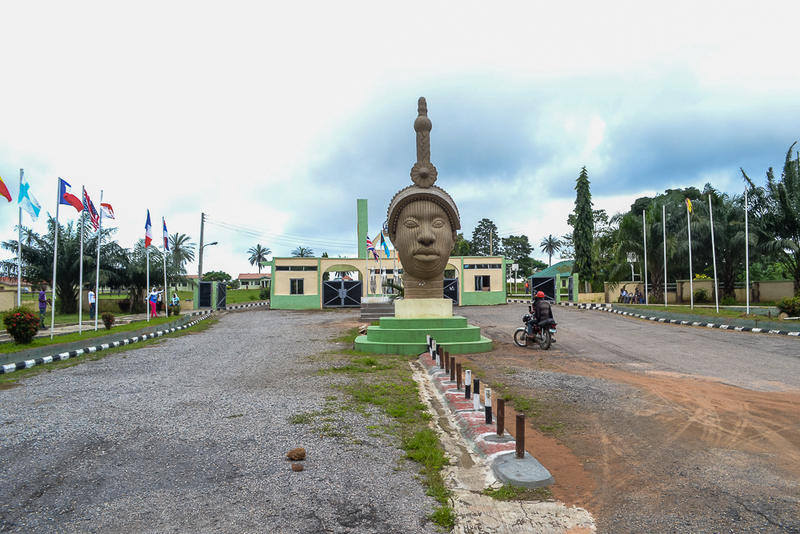 They considered numerous potential cities, and their chosen architect, Arieh Sharon, suggested Ile-Ife should be selected. In 1960, Sharon and Nigerian planners toured universities in many parts of the world, considering design, planning features, and suitability of architecture to site. Levin suggests Sharon was particularly impacted not only by the schools he examined, but by the spatial arrangements of Maya centers in Mexico—tight, interconnected complexes surrounded by lush greenery, with several buildings conceptualized as inverted pyramids. Arieh Sharon (1900-1984), a well-known Israeli architect, designed the university in 1961. A number of African institutions looked to Israel in the early years of independence, partially because it had rapidly created a progressive nation with original cultural attributes, and partially because its climate was closer to that of Africa than many European countries. Sharon had trained at the Bauhaus in Germany in the 1920s before moving to Tel Aviv where he created numerous government buildings, kibbutzim, and communities. He brought experience in designing for hot climates to Nigeria, as well as intimate familiarity with Modernism—the latter a way to reshape the image of Africa as a forward-moving continent. 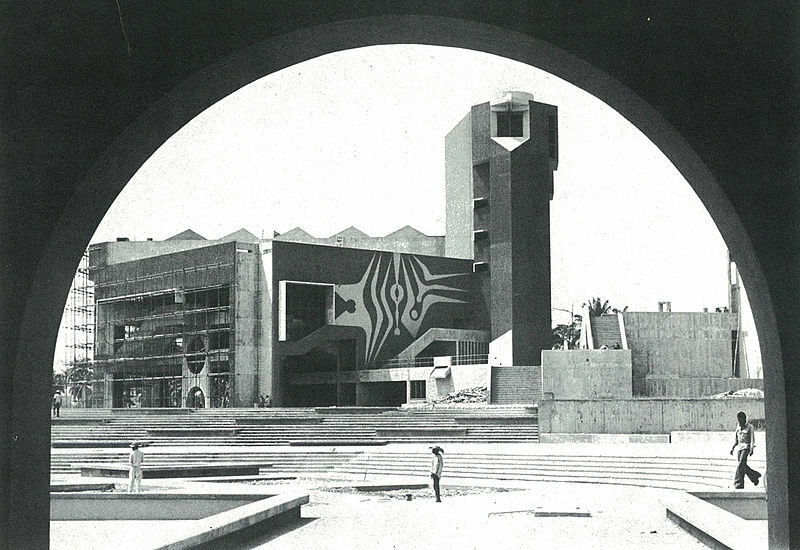 His OAU buildings varied in their dates of construction, but are made mainly from concrete, designed to accommodate the tropical climate and sun exposure, with ventilation provided through open hallways and stairways. The Main Core is the pedestrian-only heart of the campus and features both administrative buildings and general student service spaces. 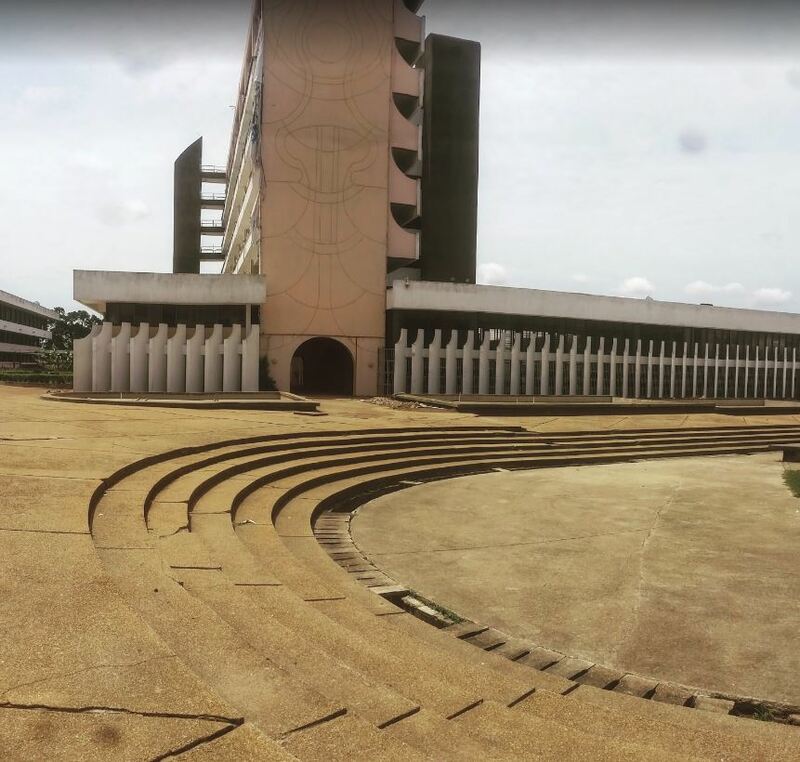 Its composition was originally planned for the Secretariat, the Assembly Hall, the Hezekiah Oluwasanmi Library (named after OAU’s second vice-chancellor), and four Faculties--Humanities, Law, Administration, and Social Science. All were arranged around a green quadrangle and interconnected through paths, the uneven terrain necessitating terraces and ramps. Jutting rooflines and roofed walkways afforded protection from both sun and downpours in the rainy season. The Humanities buildings were erected between 1963 and 1965, their stark shapes resembling reversed pyramids. The strong horizontals of their cantilevers visually link them to the nearby library (1966). The Secretariat (1968) was designed to house the university administration and act as a student center; a non-objective sculpture acts as a gate to the Modernist structure. The Faculty of Education Building (1970) echoes the shape of the Humanities building with another upside-down pyramid design, but its proportions differ. Like many of Sharon’s Israeli structures, it is raised to promote air circulation below the building. The Assembly Hall (now Oduduwa Hall), constructed from 1972 to 1976, is the Core’s most flamboyant building. Designed with an adjacent amphitheatre, it has a dramatic shallow-steps approach from the plaza. The main building holds 1400, while the amphitheatre can house a larger audience of 3500. Its exterior includes organic forms in white against a darker concrete. While this pattern is not particularly Yoruba, it is pseudo-African in its abstraction, part of a limited intent to make the architecture site-specific. Other Sharon inclusions, such as the concrete column and striated surface treatments, are also intended as references to the ancient city that became the university’s home. Sharon was also responsible for the early residence halls (1964), but construction did not cease with the completion of his work at OAU with his son Eldar Sharon, Harold Rubin, and AMY Ltd. Later University structures by other architects followed his Modernist lead. Notable additions include the Faculty of Health and Sciences building, which exemplifies repetitive rectilinear designs from neutral tones such as brown and ivory, and the locally-dubbed “Spider,” the Civil Engineering building. One of University’s most notable buildings is its Natural History Museum. Its existence was first broached in 1971, but it was not finished and commissioned until 2011. Designed by architect Patrick Ehinmowo and his firm Platform Concept Ltd., it is one of the most adventurous and notable Modernist museum exteriors in West Africa. Its very geometric design emphasizes the triangular and pyramidal roofing, which recalls the upside-down pyramid designs of the Faculty of Education and Humanities buildings. 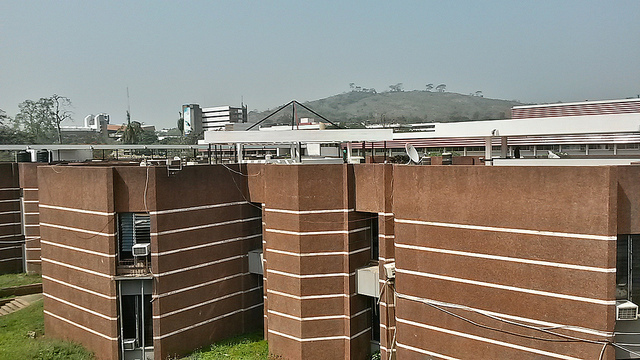 The exterior’s neutral browns further tie it to Awolowo Hall and the Health and Sciences building, among others. 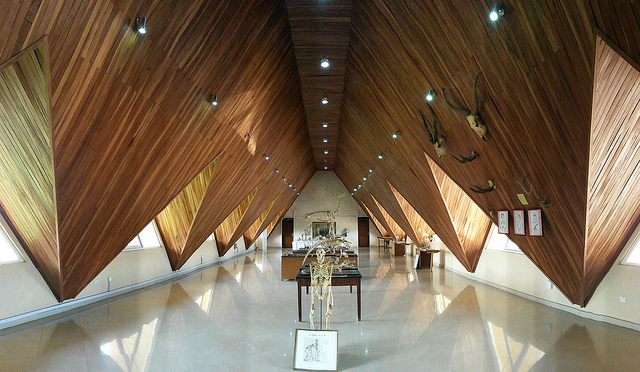 The museum includes taxidermy specimens, 20,000 plants within a herbarium, and archaeological specimens from Ife. Apart from its varied architecture, OAU’s landscaping keeps it from being a series of concrete islands. The buildings are integrated with the surrounding palm trees via numerous green spaces that surround the main structures. Concrete expanses are even broken up by small framed triangles of grass. 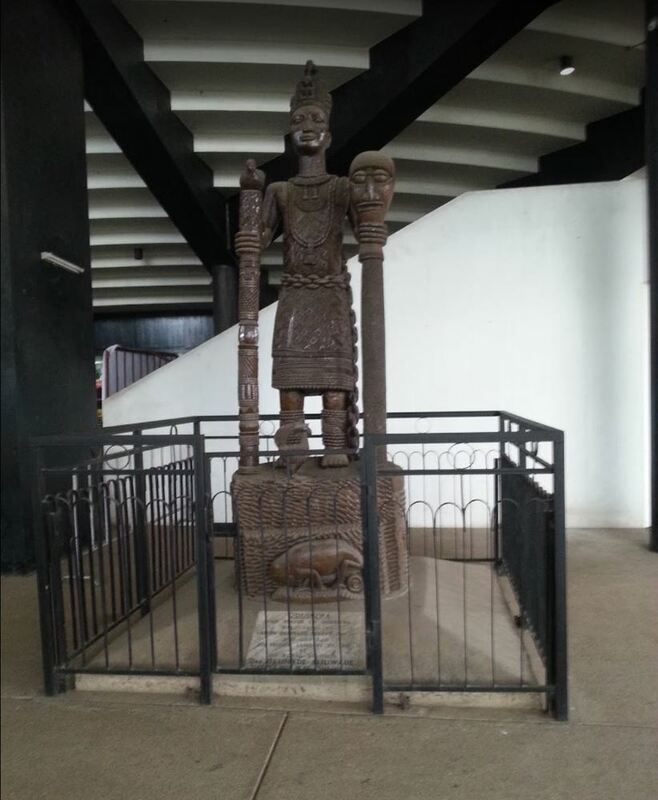 Karolina Bazylinska, Cleveland State University and Kathy Curnow, “Obafemi Awolowo University, Ile-Ife, Nigeria,” Bright Continent, accessed April 20, 2019, https://access.thebrightcontinent.org/items/show/27. Gitler, Inbal Ben-Asher. “Campus Architecture as Nation Building: Israeli architect Arieh Sharon's Obafemi Awolowo University Campus, lle-lfe, Nigeria.” In Duanfang Lu, ed. Third World Modernism: Architecture, Development and Identity, pp. 112-140. New York: Routledge, 2011. Levin, Ayala. “Exporting Architectural National Expertise: Arieh Sharon's lfe University Campus in West-Nigeria (1962-1976).” In Raymond Quek and Darren Deane with Sarah Butler, eds. Nationalism and Architecture, pp. 53-66. Burlington, VT: Ashgate, 2012. Niemann, Bernard J., and William H. Tishler. University of Ife Physical Development Plan, Ife, Nigeria. Madison, WI; School of Natural Resources, Dept. of Landscape Architecture, 1969. Olaniyan, Richard. 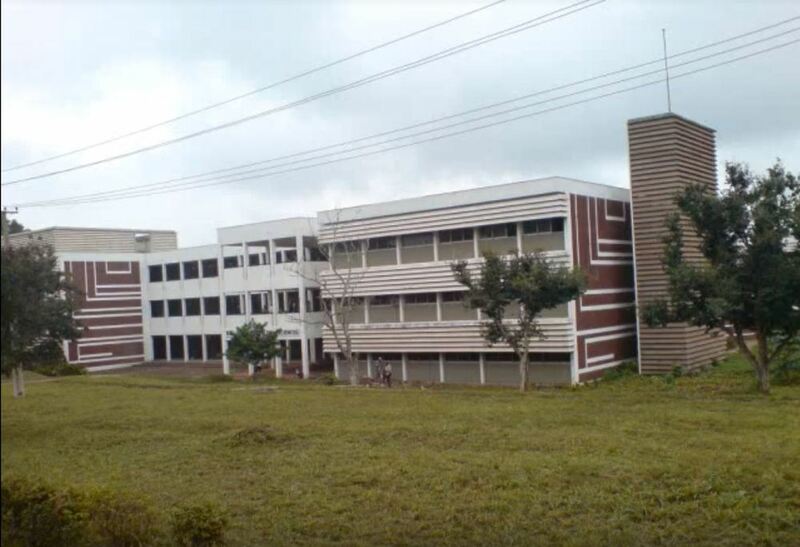 Obafemi Awolowo University, Ile-Ife, Nigeria; Decades of Service to the Nation. Ile-Ife, Nigeria: The University, 1987. University of Ife. University of Ife, Nigeria: Installation of Chancellor. Ibadan: University of Ife, 1967. William, Lizzie and Mark Shenley. Nigeria: The Bradt Travel Guide. Chalfont St. Peter, Bucks, UK: Bradt Travel Guides, 2012. Falola, Toyin. "Yoruba Writers and the Construction of Heroes." History in Africa 24 (1997): 157-175. Published on Dec 25, 2017. Last updated on Jan 1, 2018.